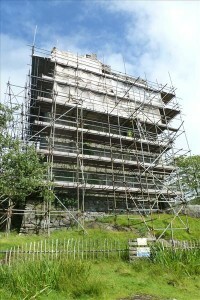 Since 2006 Moy Castle has been permanently cloaked in scaffolding. At the end of summer 2013 some of the scaffolding on the seaward elevation was removed (new photo to be added) as we had completed this phase of work. Scaffolding was adjusted on the other three elevations to allow for more lime-work down to lower levels as we were given more money from Historic Scotland in late summer 2013. During these seven years a great deal of work has been completed to ensure the continued survival of this unique building, including the addition of greenheart timber to stabilise the wall walks before they were covered with clay and turf. Twenty-three new lead drains were manufactured individually, on site, to replace the decayed, earlier stone and slate drains. Some archaeological work was undertaken on the upper floor prior to a new drain being laid and the floor covered with clay and turf. Caithness stone slabs have been laid on both wall walk and upper floor to protect the turf. A new roof was built to help keep rain out of the stair well and a new handrail was manufactured and installed by a local tradesman. A new drain was installed in the space which we call The Chapel, intended to remove water that accumulated in the newly laid drain on the upper floor. The scaffolding is down! However, there is still work to do, and we still need to raise more money in order to be able to continue. The main door and its hinges have to be repaired or replaced. As these fix into the masonry this work would be completed at the same time as the repairs to the entrance masonry and steps as the original ones are unsafe and difficult to access. Historic Environment Scotland, our main funder, is preparing the next grant which will let us do the work around the entrance to the castle. Our part of the grant is likely to be around 25% of the total cost of £80,000. Every one can help by donating towards the work.